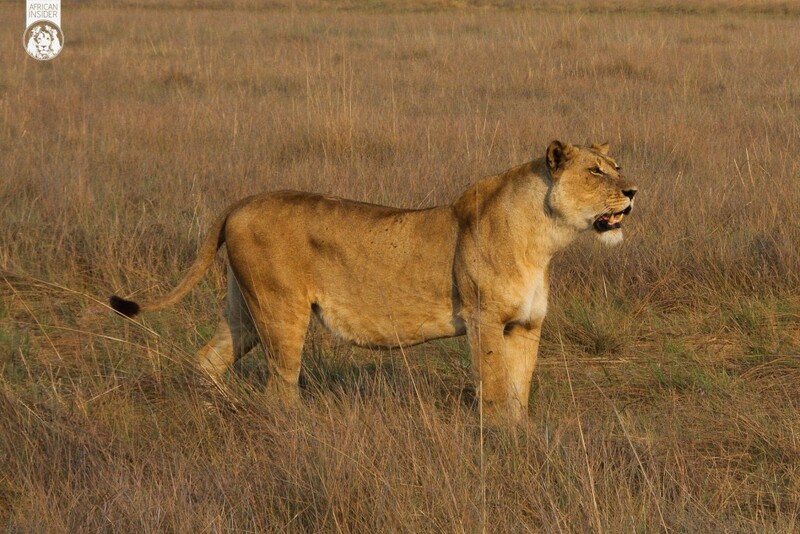 Zambia’s Busanga Plains in Kafue National Park is a unique and exciting place. 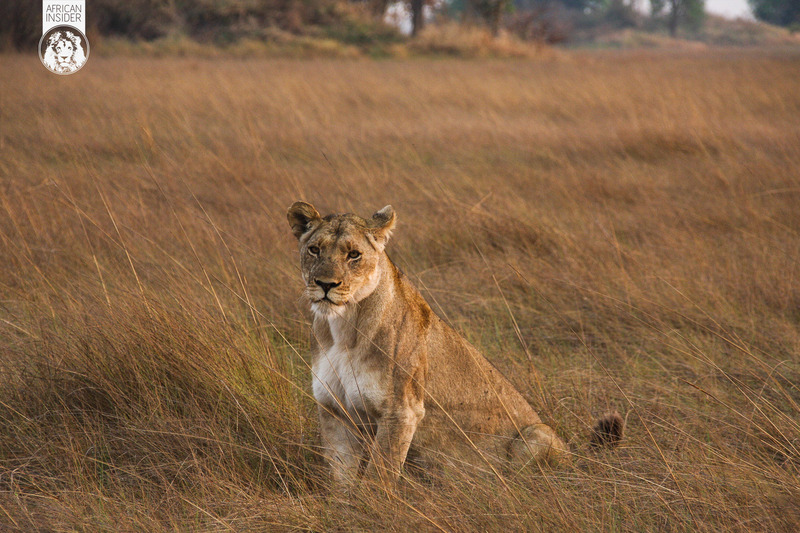 When I pulled out of a Wilderness Safari’s camp one crisp morning, while guiding a family of 6, we quickly picked up on fresh tracks left by a group of 5 lions. I knew it was going to be a good day. We started to follow the tracks and to my surprise found the lions running towards us in the opposite direction to where the tracks had been heading. 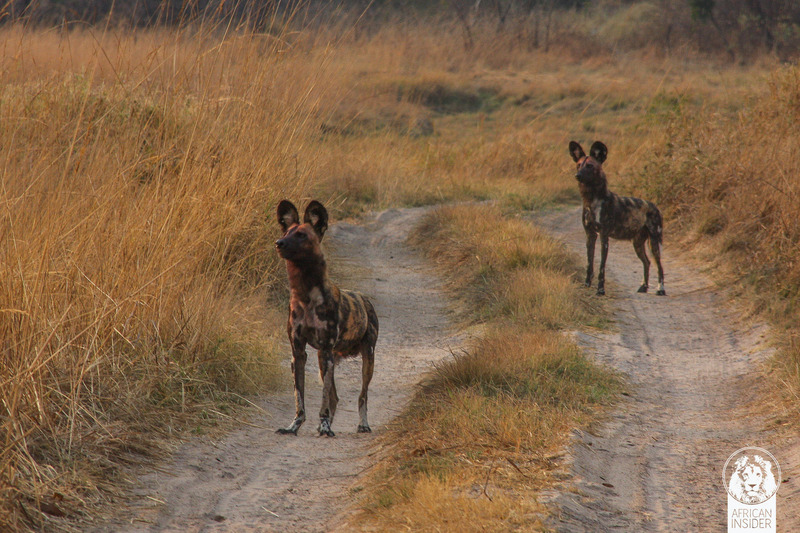 It was clear they had heard something behind us, which had demanded their immediate attention. A Lioness pauses briefly to listen for updates on the noise which attracted them. 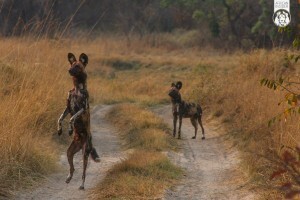 Wild Dogs had recently taken up temporary residence on an island of vegetation amongst the open plains of the Busanga. They had also taken to expertly reducing the islands substantial bushbuck population. 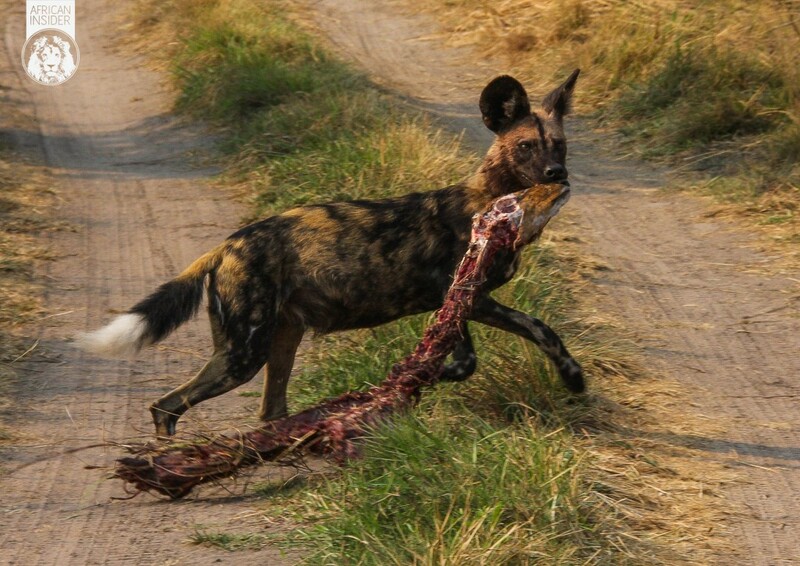 A short distance later it was confirmed that the commotion of the wild dogs killing a bushbuck was indeed what had drawn the lions away from the path to their original intended destination. To my surprise and concern I could see across the open plain that the pack had made the ill-fated choice of bringing their pups to feed at the carcass. 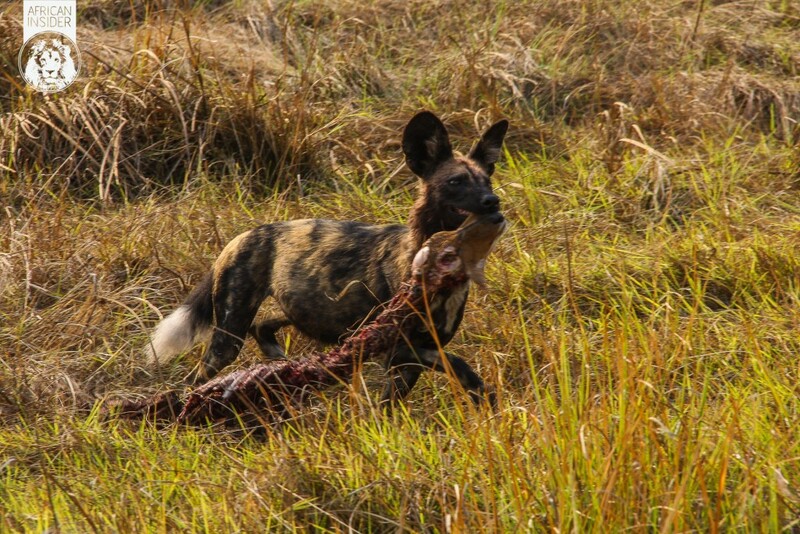 The more typical and successful strategy is for the adult dogs to regurgitate freshly eaten meat for the pups at the relative safety of the den site away from the carcass. The pack had killed the buck in an open grassy plain in front of our position, just off of the island’s vegetation. were unaware of the imminent danger. The lions had slowed their pace right down, from running with clear intent, to a precisely calculated stalk with even clearer intent. Competition between predators in Africa is rife and the idea of seeing highly endangered wild dogs along with their puppies obliterated by the more powerful lions was not the type of interaction I would ever hope for. We were relieved when the wind carried the scent of the stalking lions to the dogs. The dogs looked up sharply and saw some of the younger lions unable to contain themselves, eagerly break the precise and deadly stalk that their mothers had engaged. The focus of the lions gave away their intention in no uncertain terms. What followed was fascinating. Two of the adult dogs made a vocalisation which the pups instantly reacted to and in a flash the pups along with the two adults vanished into the island vegetation. Instead of immediately fleeing to safety, the remaining adult dogs split up and surrounded the lions expertly distracting their attention away from the pack’s greatest treasure, the puppies. At this point the action was 360 degrees and the dogs were doing their utmost to distract the intruders. 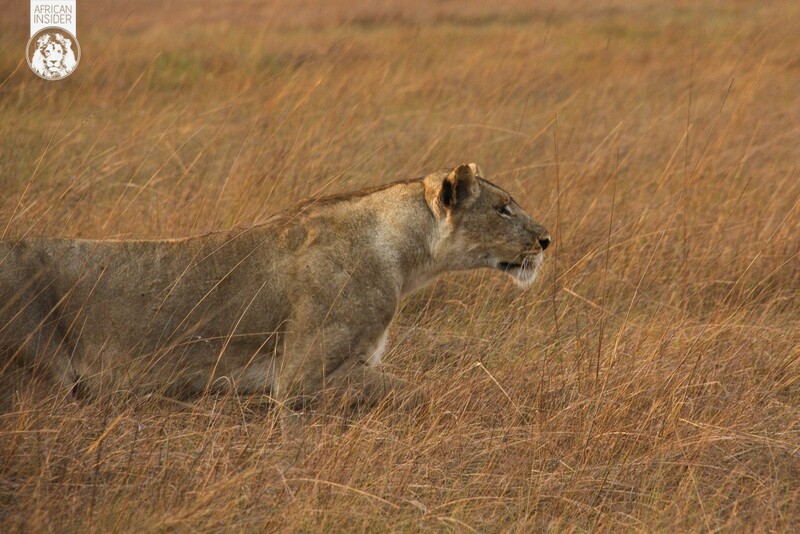 The lions were in the long grass where the dogs had originally made the kill. They were making darting charges at the dogs, angrily snarling and growling at their foe, while the dogs fleeted like nimble athletes around the perimeter of the lion’s position, ensuring the lions did not follow the more vulnerable members of their pack. 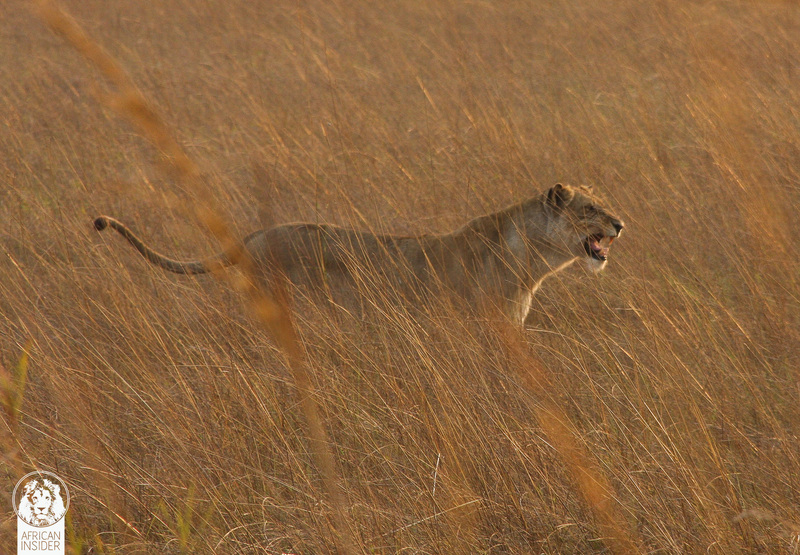 One of the lions snarling through the long grass at the Alpha dog in front of our vehicle. I decided to position our vehicle on the road in front of the Alpha dog and one of his companions. Cat and dog were at a stalemate. It was at this point that the two dogs in front of our vehicle, eager to get an unobstructed view of the lion’s position over the long grass, began to hop on their hind legs. It is difficult to describe the feeling I experienced as this was happening. The Alpha Male in front, listening intently and unable to see through the long grass. 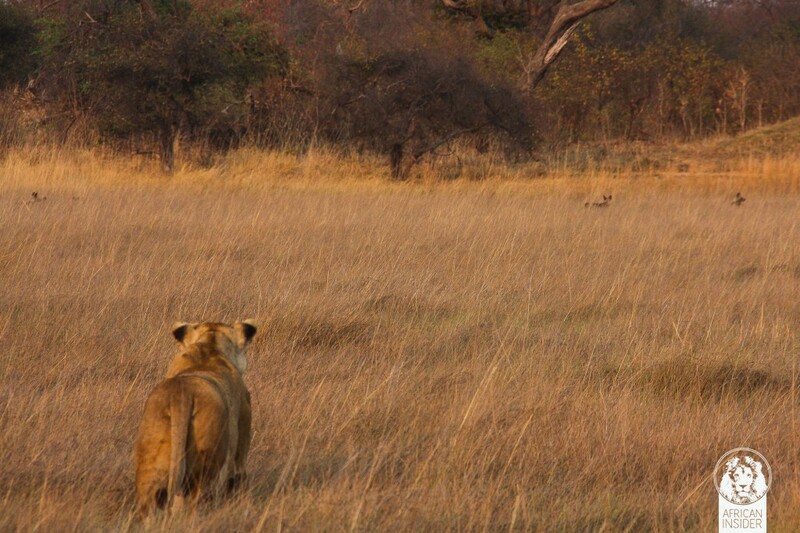 Sometimes, as a guide, one has to remind guests to remain quiet in such action packed sightings. On this day all I could hear from my guests (and myself) were quiet gasps of delight at the unique, comical and incredible behaviour we were witnessing. When both dogs were on their hind legs at the same time, I knew I had an image I would remember for the rest of my life. 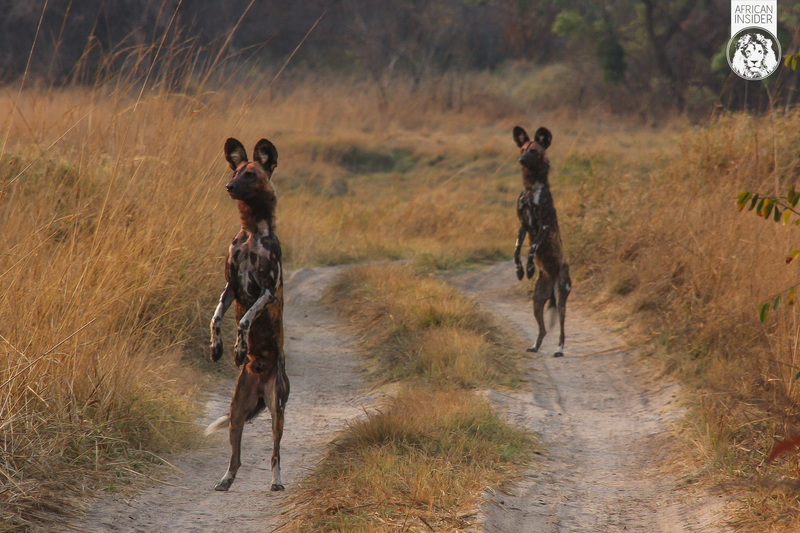 I could not help but think to myself that it felt more like I was looking at Meerkats rather than wild dogs. 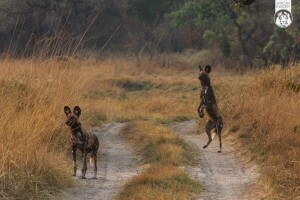 Once the Alpha started hopping on his hind legs the second dog quickly copied him. I anticipated this moment but could not believe my eyes when it happened. The dogs cleared off quickly once the pups were well on their way to safety and strangely the lions had been so preoccupied with the dogs that they did not go to the remainder of the carcass. The dogs did not need to be invited twice and once the lions were out of sight silently returned to the carcass and finished it off. Surprisingly the lions did not notice the substantial remains of the bush buck carcass and cleared off without claiming the prize. 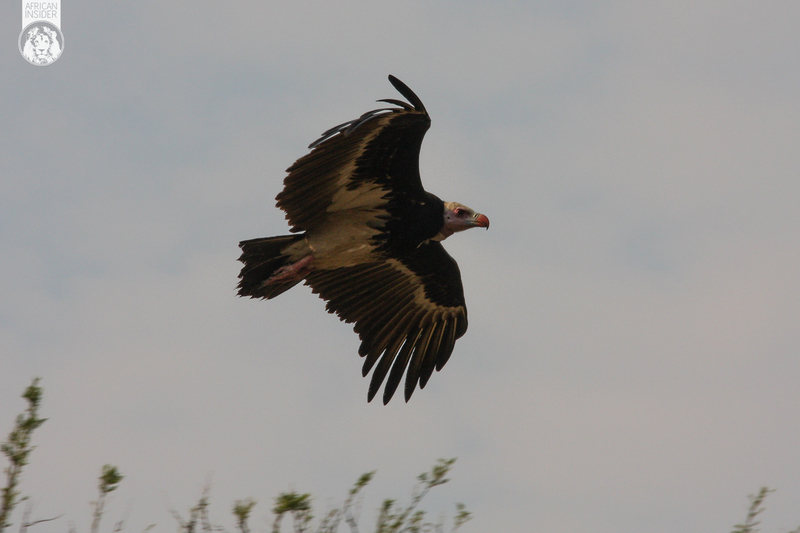 A white headed vulture arrives on the scene attracted by the commotion. One of the dogs retrieving the remains which were substantially more than that. They ate in silence before moving the remains. NEXT Why the spate of big cat attacks on guided tourists?